Ketchup packets, Tootsie rolls and sushi are among some of the funniest and most imaginative baby costumes to go on sale for Halloween 2012. While not to everyone’s taste, the wacky outfits will no doubt be a hit with parents who want their newborns to stand out. This year Target has produced a whoopee cushion suit for toddlers, printed with a sketch of a woman exclaiming “Oops!”. While The Wishing Elephant suggests its California Sushi Roll ensemble is the perfect choice for toddlers this season. The onesie, featuring flecks of orange and green, comes complete with imitation crab, carrots, avocado and rice. Designer Carolyn Caffelle, who is based in Somersworth, New Hampshire, says: “Turn your toddler into a sushi roll for Halloween! For parents looking for a more traditional look for their infant, there are plenty of seasonal wares to pick from. Little Bird Lucy, an independent store holder featured on etsy.com, sells a knitted pumpkin hat for newborns touted as an “instant photo prop”. 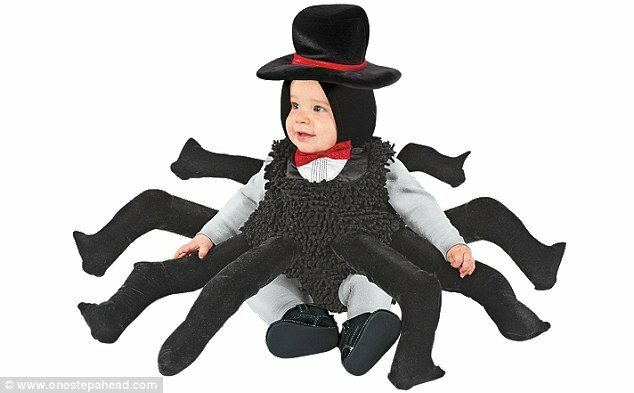 And One Step Ahead offers an eight-legged spider costume, complete with giant, jiggling legs and a velour top hat. Foodie parents are in luck, as food-inspired wares are rife. Buycostumes.com sells giant Tootsie Roll and peanut suits for youngsters, while shop.com has an eye-catching hot dog disguise. And on the fast-food theme, Target suggests parents squeeze their infant into a giant Heinz ketchup packet and Amazon serves up a baby taco outfit, complete with lettuce and meat shaped detailing. It adds that comfort and safety are important to consider when selecting a child’s costume.